Secondary double glazing has been installed inside the metal windows along the Guilford Street and Lamb's Conduit Street elevations to the main part of the library. This is part of an ongoing programme to improve temperature levels in this part of the library, following on from the problems experienced last winter. The new glazing incorporates sliding panels so that when (or if) we get a hot summer, the external windows may still be opened. The radiators will be replaced in due course, and it is planned to add similar glazing to the wooden framed windows near the photocopiers in due course. UCL has set up a trial of the online Global Health database. It can be accessed onsite from http://ovidsp.ovid.com/autologin.html. The database is a specialist database focusing on public health research and practice. It indexes journals, reports, books and conferences and contains over 2 million records. It includes unique records that are not covered by PubMed (approximately 40%). Please contact the library if you need any assistance with searching this database. The trial will be running until 12th June. From 1 April 2013, new requirements come into force for research papers funded by the Research Councils, following the introduction of the RCUK Policy on Open Access. UCL guidelines on the implementation of the RCUK policy are now available to UCL researchers. The guidelines were drawn up by UCL Library Services in conjunction with the Office of the Vice-Provost (Research) and explain how the RCUK policy will be implemented at UCL. UCL Library Services has also produced a Publishing Guide for UCL authors, which includes guidance and tools to assist RCUK-funded authors. Multi-functional devices (MFDs) which allow UCL staff and students to print, scan (to a UCL email only) and photocopy will be rolled out at the Institute of Child Health Library this summer as part of the University wide print@ucl project. These devices are activated using the UCL ID card, and the free £12 print credit currently provided to all UCL students for their printing requirements, will now also be usable for photocopying - scanning will be free. UCL staff will have no restrictions on their printing, scanning and photocopying. UCL students wishing to top up their balance, will either be able to do this online – as is currently the case with printing – or via a cash loader device which will be installed in the library. The BMA's latest major report Growing up in the UK builds on a report it published in 1999 called Growing Up in Britain. The BMA acknowledges that some progress has been made but is concerned these improvements are likely to be reversed. This link takes you to a page that reviews the key recommendations, where you can read the detailed analysis, and links to the full report. The earlier report is held by the library and is shelved at WS 100 BRI. 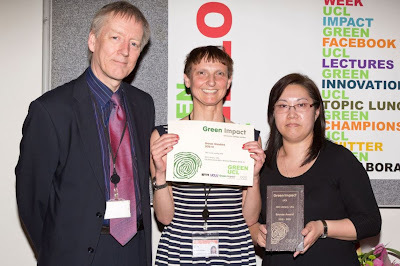 We are pleased to announce that the Library was awarded a Bronze at the UCL Green Impact Awards Ceremony which took place on 24 April. The programme encourages teams to undertake a number of actions to reduce their environmental impacts, thereby contributing to UCL's overall environmental sustainability programme. In 2011/12, 19 UCL teams signed up and completed actions as part of Green Impact. In 2012/13, 29 teams got involved in the programme and undertook actions ranging from the purchase of sustainable food to the use of UCL's waste reuse scheme, WarpIt. The photo shows the certificate and plaque held by Grazia Manzotti and Sui Jing Ly respectively at the awards ceremony. The certificate and plaque are currently on display at the entrance to the Library.